Mayor De Blasio speaks to fellow New Yorkers following the grand jury verdict not to indict the officer who put Eric Garner in a choke hold that killed him. 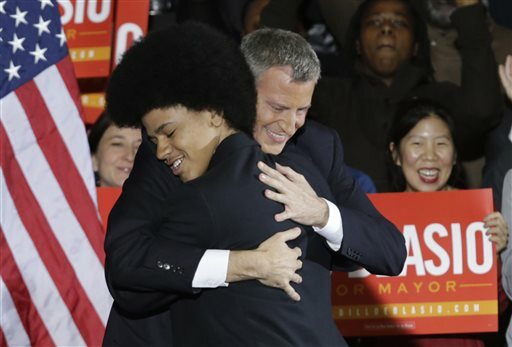 De Blasio is a white man with a black son, a mayor elected on a campaign centered on mending relations between the nation’s largest police force and the communities of color who feel mistreated and, at times, endangered by the police. “I’ve had to worry over the years, Chirlane has had to worry: Is Dante safe each night?” he said. “And not just from some of the painful realities of crime and violence in some of our neighborhoods but safe from the very people they want to have faith in as their protectors.” De Blasio and Eric Garner verdict present many lessons to be learned. He recalled how President Barack Obama turned to him last week during a White House meeting following the violence that exploded in Missouri last month after a grand jury there did not indict a white officer in the shooting death of another black man, Michael Brown. That lens helped propel de Blasio to the position he now holds. A campaign commercial last year featuring Dante talking about his father’s vow to curb the use of stop-and-frisk, the policy that allows police to stop anyone deemed suspicious but which a federal judge ruled discriminated against blacks and Latinos, helped propel the little-known candidate to the top of the polls. De Blasio urged calm, telling protesters that they would “not sully (Garner’s) name with violence of vandalism,” all the while making it clear he understood their frustration. Indeed, much of de Blasio’s first year in office has been spent aiding the city’s black and Latino communities in achieving more fairness with the NYPD. They make up his political base and his poll numbers remain much higher with them than with white voters. Beyond cutting back stop and frisk, his administration instituted a new policy to stop making arrests for possession of small amounts of marijuana, sharply cutting the number of arrests that critics felt were disproportionately minorities. 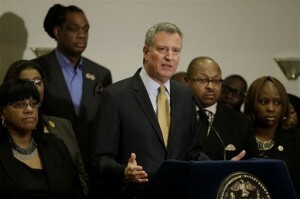 He also ordered a retraining of NYPD officers and launching a police body camera pilot program. But those reforms – along with his close ties to fierce police critic the Rev. Al Sharpton – have drawn the ire of the police unions and badly strained relations with the rank-and-file NYPD.